2 Timothy 2:13 says, “if we are faithless, He remains faithful, for He cannot disown Himself.” This is the key to understanding God’s faithfulness. 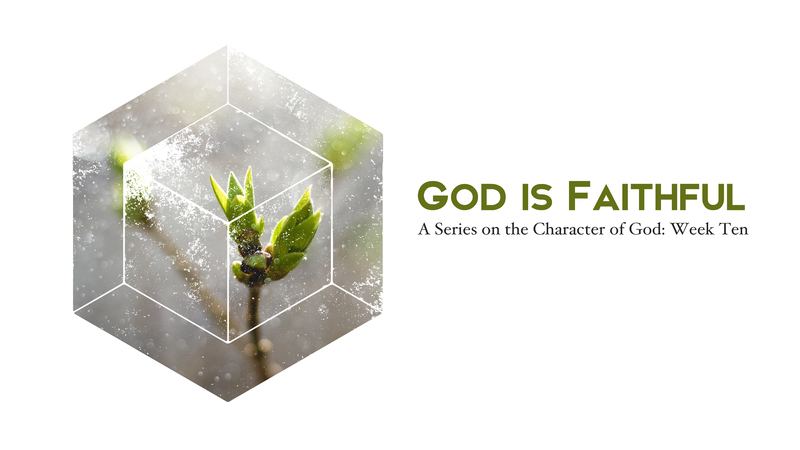 God’s faithfulness is not contingent on something in us, His faithfulness is connected with His very nature and character. God cannot be anything but faithful because to be unfaithful in any way to His promises or His desires would mean that God is acting in a way that in inconsistent with His nature. Not only is God faithful to His character, God’s faithfulness means that He will always do what He said He will do. Numbers 23:19 says “God is not human, that he should lie, not a human being, that he should change his mind. Does he speak and then not act? Does he promise and not fulfill?” Tozer wrote, “Men become unfaithful out of desire, fear, weakness, loss of interest, or because of some strong influence from without. Obviously none of these forces can affect God in any way. He is His own reason for all He is and does. He cannot be compelled from without, but ever speaks and acts from within Himself by His own sovereign will as it pleases Him.” A promise is only as good as the promiser’s ability to bring it to fruition. There is only one being in all of the universe that can always make good on their promise because there is only one being that wields all power and is completely uninhibited. Even the best intentioned man or woman cannot fulfill all of their promises because there are things that are out of their control, this is not so with God. If God promised it, it will happen. There is nothing in space and time or outside of space and time that can stop God from effortlessly fulfilling His promises. Also, there is nothing within God that will cause Him to change His mind about any of the promises that He has made. Deuteronomy 7:9 says, “Know therefore that the Lord your God is God; He is the faithful God, keeping His covenant of love to a thousand generations…” God delights in keeping His promises of love to His children. This should be a source of incredible joy and comfort for the Christian. Sometimes as we struggle with our sanctification, we may worry that God is going to abandon us. Philippians 1:6 says that He who began a good work in you will carry it on to completion. God says of Himself in Isaiah 49:15, “Can a mother forget the baby at her breast and have no compassion on the child she has borne? Though she may forget, I will not forget you!” God delights in all of the promises He has given us and has secured all of them in Jesus. He has engraved us on His hands, a permanent act that binds Him to us. He will always be faithful, so fear not Christian. Father, I have never known someone like You. Your faithfulness is something that is foreign to me because I myself am unfaithful. Cause me to rest in the fact that you never change and that You will always fulfill Your promises to me in Your word. May I never doubt in your ability or Your desire. If your faithfulness were contingent on mine, I would be lost. Thank you for being what only You are, completely faithful.